Carlsbad, CA, USA (May 18, 2016) – Guests can download themselves into an all-new 4D film experience starring the LEGO® NEXO KNIGHTS™ at LEGOLAND® California Resort starting May 26, 2016. This immersive 4D animated adventure was created especially for LEGOLAND Parks and LEGOLAND Discovery Centers around the world. 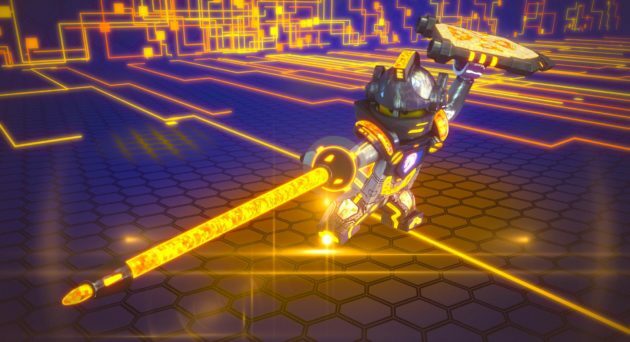 It’s up to the LEGO NEXO KNIGHTS to defeat the evil Jestro, the Book of Monsters and all their Lava Monsters all set in a 4D world – think wind, water and smoke – bringing the battle to life all around the cinema. Also, guests can go on a quest of their own to discover six shields hidden across the Resort to unlock exclusive ‘power ups’ for the LEGO® NEXO KNIGHTS™ Merlok 2.0 mobile app. Set in the futuristic world of Knighton, LEGO NEXO KNIGHTS: The Book of Creativity follows five young Knights in their quest to defeat Jestro, the Book of Monsters and all their Lava Monsters. Led by heroic Clay Moorington, the band of knights join forces with the great digital Wizard, Merlok 2.0 to vanquish the enemy and stop him from getting his devious hands on the powerful and completely unique Book of Creativity, and something never seen before in Knighton. The brand new 12 minute film is the latest way for children to interact with the NEXO KNIGHTS innovative world. More than 170 shields can be found across various touchpoints including online, on LEGO sets and by watching the TV series. These shields can be scanned onto the Merlok 2.0 app, upgrading players’ powers to help the Knights fight marauding monsters. Those who already have the app will be delighted at the chance to get exclusive ‘power ups’ at LEGOLAND California Resort to enhance their playing prowess. And those who don’t should download before they visit to kick-start an exciting play experience with exclusive content. Young squires will start their journey just outside of LEGO Showplace, which also features The LEGO® Movie 4D A New Adventure. While on the hunt for their next shield, guests will trek their way through NINJAGO® World, which spotlights the new adventure, NINJAGO® The Ride where guests can use hands free technology to defeat villains. Adventurers will also voyage through LEGO® Friends Heartlake City, where they can stop for a yummy treat and ride one of 62 horses and jeeps in Mia’s Carousel and interact with the LEGO® Star Wars™ Miniland Death Star Model Display made of more than half a million LEGO bricks. LEGO NEXO Knights™ 4D – The Book of Creativity is included in admission to LEGOLAND California Resort. For more information, log onto www.LEGOLAND.com.